Performing together for two nights in a dynamic duo, Fathy Salama and Ghalia Benali will be hosted by the Cairo Opera's Open Air Theatre on 14 July – as part of the Opera's Ramadan Evenings – and by the Bibliotheca Alexandrina's Great Hall on 26 July. Salama's inclination for collaboration with Egyptian and regional artists has previously seen him play with Benali. He told Ahram Online in an interview this month that the two are engaged in a cooperative process that may lead to the co-production of an album. Ghalia Benali will also perform as part of the fourth edition of the Mawaweel Festival hosted by Darb 1718 and co-organised by the Cairo Jazz Club Agency. Her concert at Darb 1718 is scheduled for Thursday 17 July. 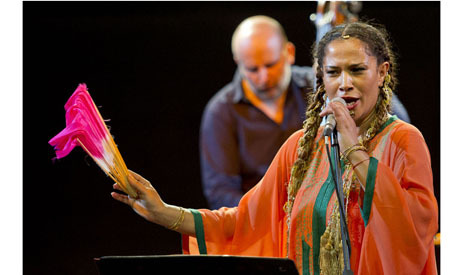 Benali, who was born in Belgium but grew up in the Tunisian town of Zarzis, is known for amalgamating musical influences and traditions from East and West – such as her fusion of elements of Arabic classical style with jazz and Indian music. For information about more musical events during Ramadan, please check out our full agenda of the month's cultural events.